Structuralist rhetoric tailored to the "little narcissisms, psychological paltrinesses" of a lover. 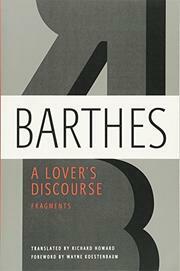 Though he keeps Goethe's Werther at hand like a margin, Barthes mostly forsakes his beloved "pleasure of the text" to dissect any lover's agony down into what he calls "figures" or tropes: jealousy, languor, dependency, crying, dedication, all those shifting states you're washed by daily when in love. As always with Barthes (and translator Howard), there is fearless use of opacity ("The subject who is under the ascendancy of the Image-repertoire 'offers' nothing in the play of the signifier. . .")--no Joan Walsh Anglund trifle this, you may be assured. But it does have its endearing side: Barthes sets out and at least three-quarters succeeds in limning every disquieted symptom of the Sweet Sickness. If you can step around the gummy terminology, you can watch his passionate attempt to coax out what love's not-here-and-not-thereness keeps caged and moaning. Barthes demands that criticism be active; well, here it really sweats. Probing.